Jazz fans have been subjected to a bait-and-switch strategy at the movies a number times in recent years—titillated time and again by word of a new movie featuring a jazz subject, only to be sadly disappointed by the product that arrived on the screen. Not so with Chasing Trane, which is a comprehensive and affectionate document of the life and extraordinary musical career of John Coltrane. Neither serious jazz listeners nor neophytes will be disappointed by this film written and directed by the acclaimed documentary filmmaker John Scheinfeld. Released in 2017, the film was produced with the full support and participation of the Coltrane family and the recording companies that collectively own Coltrane’s recorded legacy. The production artfully combines generous samples of the man’s music, including performance clips, with talking-head commentary, interviews with family, colleagues and famous fans, and home movies. Its primary cast includes Denzel Washington, an excellent choice as the voice of Coltrane, the bassist and longtime band mate Reggie Workman, son Ravi Coltrane, biographer Ashley Kahn, and legendary saxophonist and Coltrane admirer Sonny Rollins. Set against the social, political and cultural landscape of Coltrane’s times, the movie details the evolution of the saxophonist’s repertoire, as he personalized the music of the Great American Songbook, developed an impressive library of original compositions, some of them breakthrough in musical concept, and helped lead the way into the avant-garde. 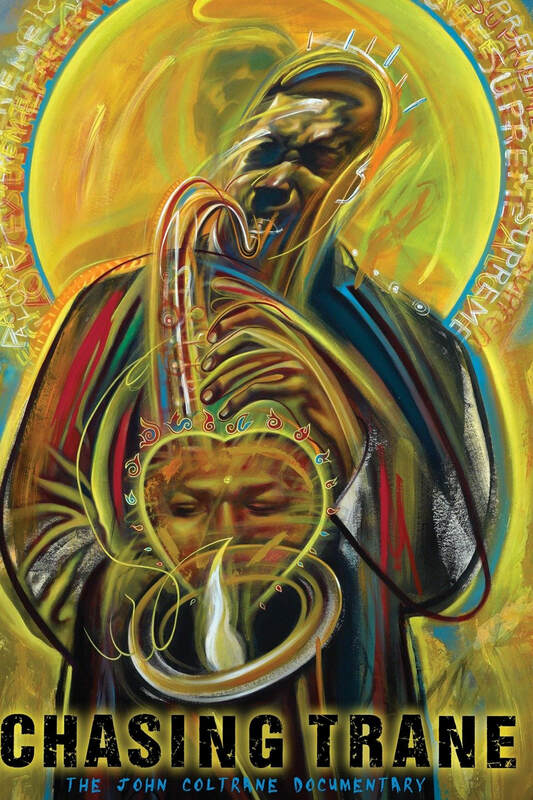 For longtime listeners to the music of John Coltrane — this mystical genius among us, this transcendent, aloof figure looming over us mere mortals — Chasing Trane offers the rare treat of engaging with Coltane the man. Here he is now, relaxed, casual, hanging with family and friends, mugging for the camera, grinning, mock-bowing. And when the film comes to its end, you’ve spent 99 minutes having experienced the whole package: the artist, the hero, and the man. Chasing Trane is available in DVD and streaming forms.